They dismissed claims they were heading for a divorce as ’embarrassing and laughable’ in June. 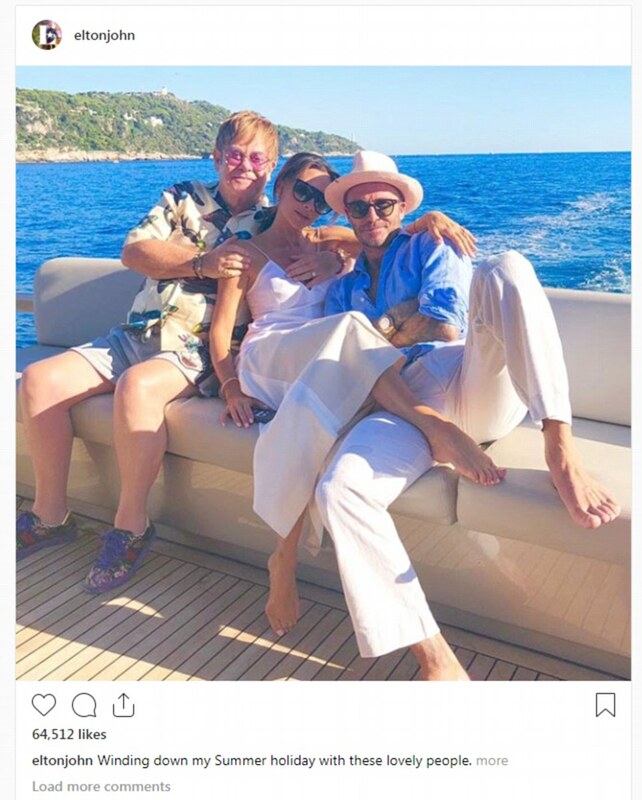 And David and Victoria Beckham well and truly put an end to split rumours as they enjoyed a rare public display of affection while enjoying a family day on-board Sir Elton John’s luxury yacht in the South of France on Saturday. 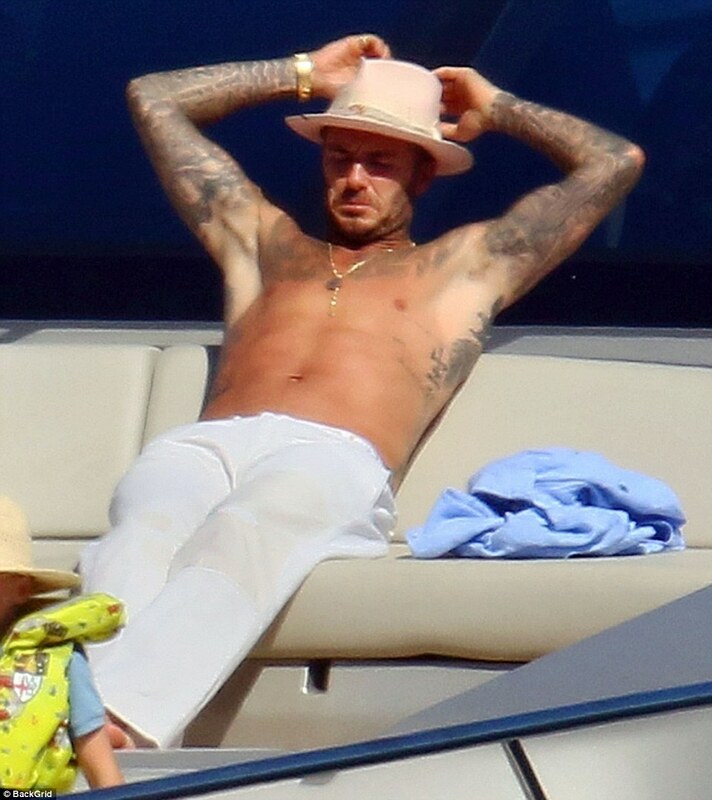 Cosying up in an intimate moment, shirtless David, 43, looked extremely tactile as he showered bikini-clad Victoria, 44, with kisses as they enjoyed some alone time on the prow of the boat. The couple shared a tender moment as they relaxed in the sunshine, proving they’re still just as smitten after 19 years of marriage. 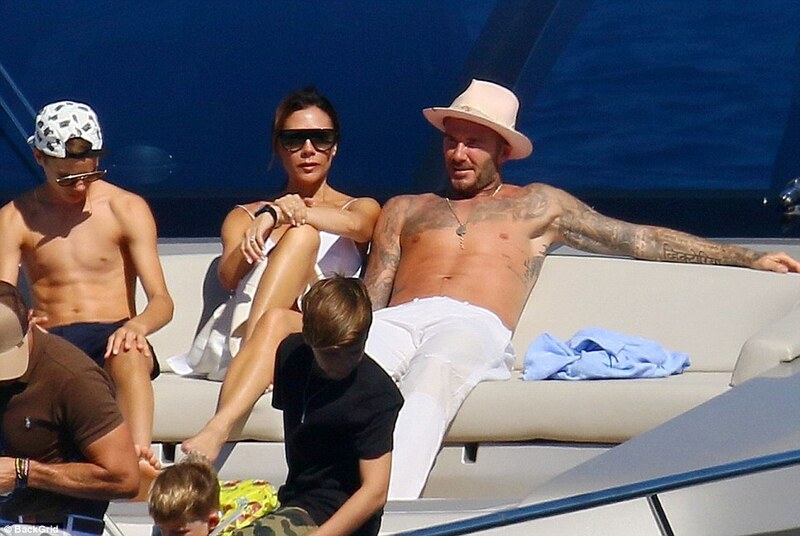 Victoria was spotted sunbathing on the deck, wearing a navy two-piece as she topped up her tan, while husband David showered her with kisses. 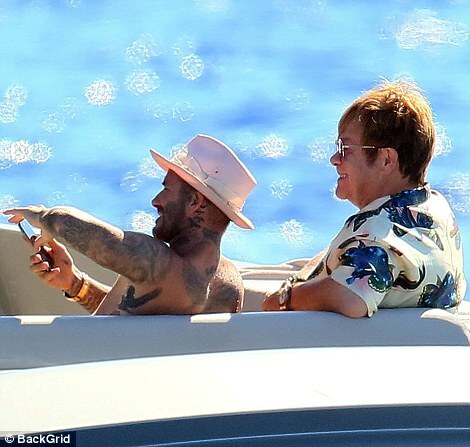 The showbiz couple put on a rare display of affection as they basked in the sunshine during the family getaway – dispelling split claims once and for all. 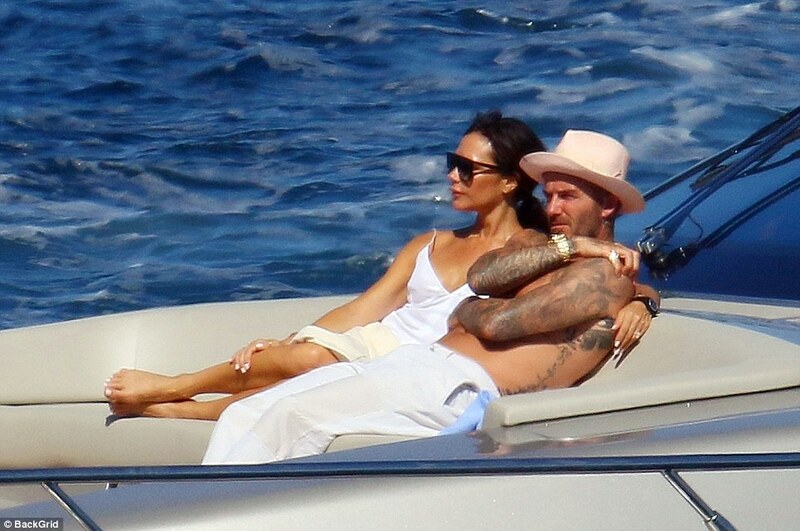 David and Victoria later changed into matching white ensembles, and were seen reclining on the deck together, enjoying some one-on-one time. 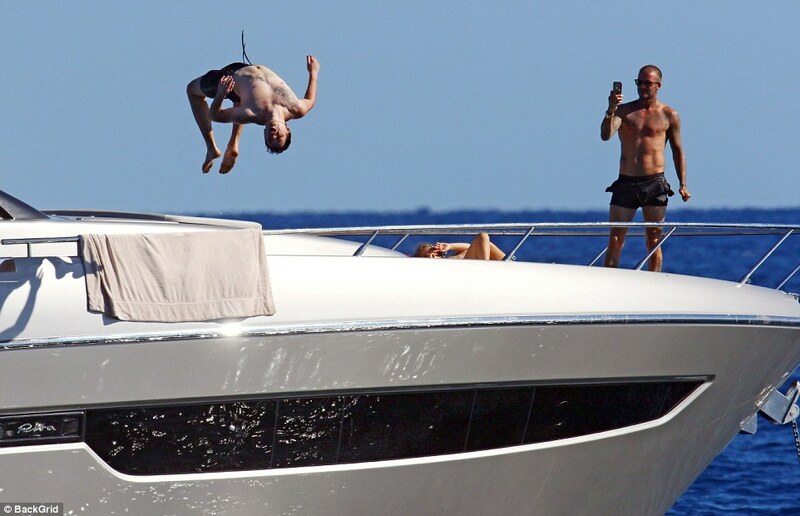 Fun in the sun: The Beckham family continued to soak up the sun on the French Riviera, larking around on the decks in their swimwear and performing some highly impressive stunts into the ocean. The couple looked happier than ever – having reportedly told their children that ‘Daddy’s not a cheat’ after rumours began swirling that they were going to divorce. 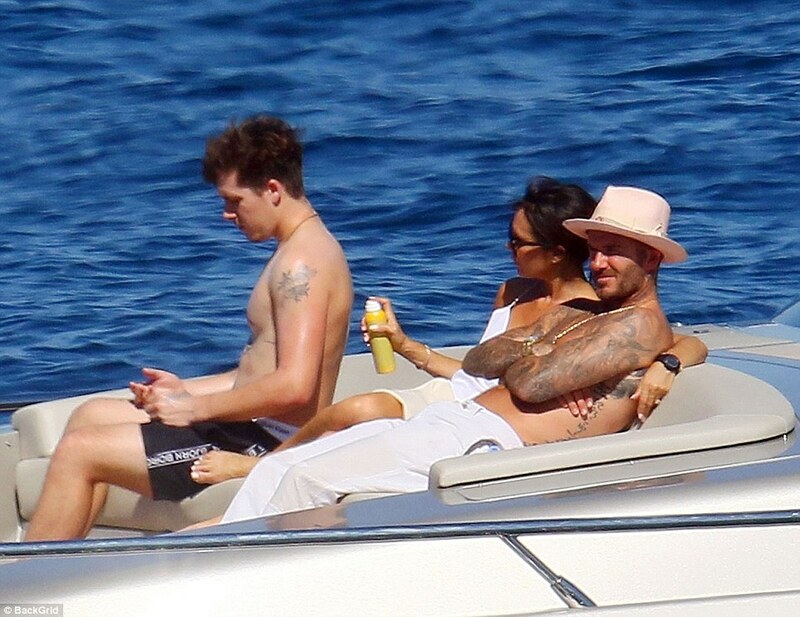 Back in June, Posh and Becks were forced to vehemently deny speculation that they would be splitting up – with them allegedly admitting that during that turbulent time Victoria sat down with their four children to reassure them about the state of their parents’ marriage. Victoria is said to have made the admission in an interview with Vogue which will be published this week, according to The Sun. The chat with the publication was intended to mark the former pop star’s ten years at the helm of her eponymous fashion label – but Victoria took the opportunity to address divorce rumours as well. ‘They sat the children down and addressed these horrific, hurtful whispers,’ a friend of the Beckhams told the publication. ‘Both David and Victoria are very transparent with the kids to ensure they hear things directly from them — and not from the playground. The source added that while the couple of 21 years laughed off the rumours publicly, they took it ‘much more seriously’ at home. The couple first began dating in 1997, before tying the knot in 1999. At the time of the divorce rumours, Jo Milloy, a spokesman for Spice Girl-turned-designer Victoria, told the Daily Mail the gossip was ‘absolute nonsense’. Meanwhile the former England football captain’s spokesman, Simon Oliveira, dubbed the claims ‘embarrassing and laughable’. ‘There is no statement due, no divorce, and a lot of Chinese whispers and fake social media news,’ he said. ‘This is all very bizarre and an embarrassing waste of time,’ he added, before adding that the rumours were ‘a crock of s**t’. Claims the couple were planning to divorce circulated on social media earlier in the summer, prompting high street bookmaker Paddy Power to suspend betting on them separating. Paddy Power’s move came despite there having been no suggestion the couple were having any marriage difficulties. Later that month the Not Such An Innocent Girl songstress Victoria revealed she tries to be ‘the best wife’ as she discussed juggling her busy work and home life at the Forbes Women’s Summit in New York, where she gushed about her ‘incredible’ husband. On board the yacht, Victoria showed off her lithe frame in a navy bikini, which she covered in a bright orange and pink robe. The robe was a long-sleeved number with a collar, which fell loosely around Victoria’s figure and tied at the front, teasing her taut waist and lean legs. She swept her brunette tresses back into a ponytail and added dark shades to the ensemble as she stood on the deck of the vessel and snapped shots of her husband and their four children. 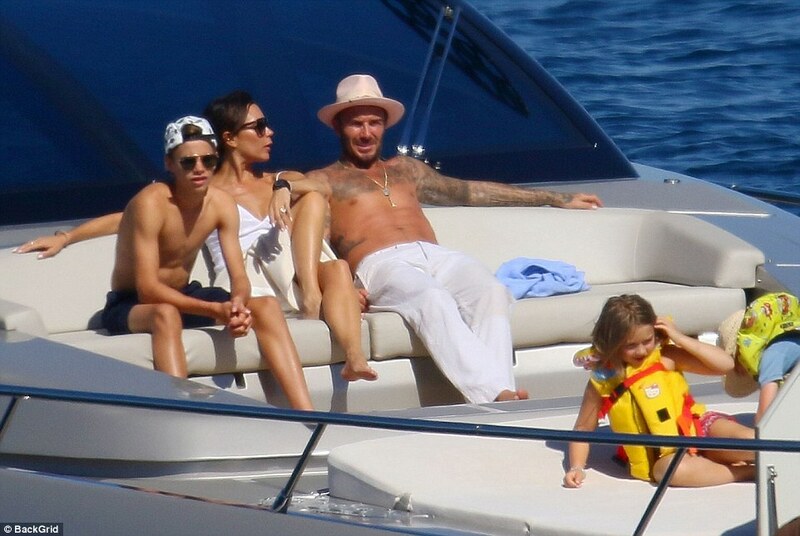 David, 43, was seen playing with his three boys – Brooklyn, 19, Romeo, 16, Cruz, 13 – and daughter – Harper, seven – as they larked around on the boat, dived off the decks and swam in the crystalline ocean. There were also several stunts on display as the older boys back-flipped off the edge of the luxuriant vessel. 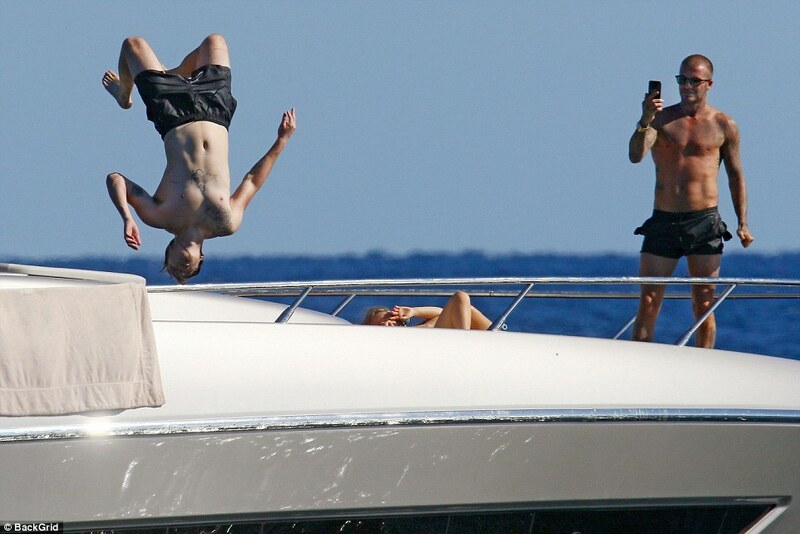 David, Brooklyn and Cruz wore black swimming shorts, while Romeo emulated his mother’s colour palette with pink board shorts. 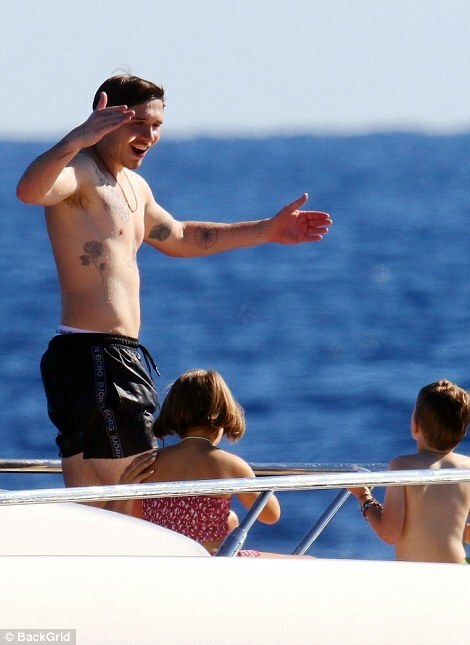 Harper was also wearing a pink swimming costume with a pattern of tigers on it. Victoria opted to stay dry, watching from the boat and capturing the fun on her phone camera. 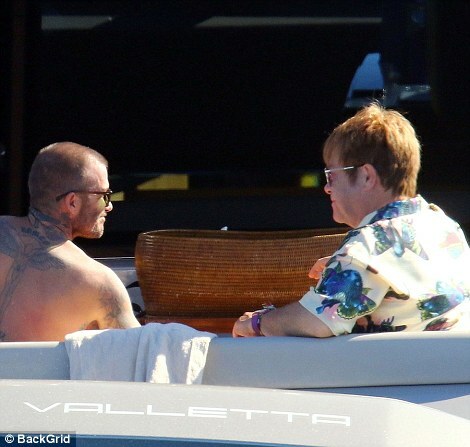 She later joined her host Elton, 71, who also kept away from the water, seen chatting to him on the upper deck. 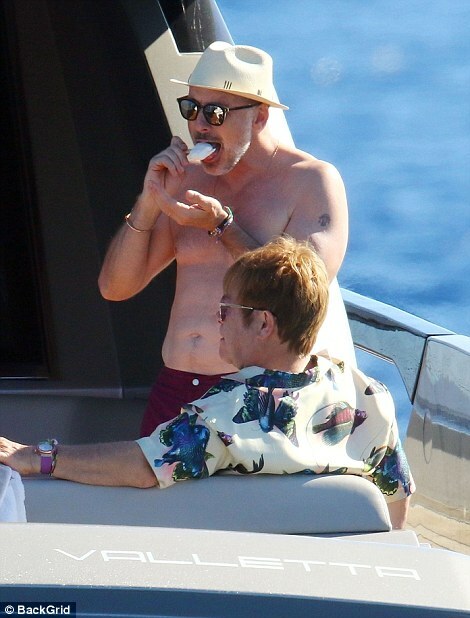 He wore a Hawaiian-print shirt as he relaxed in the sun. 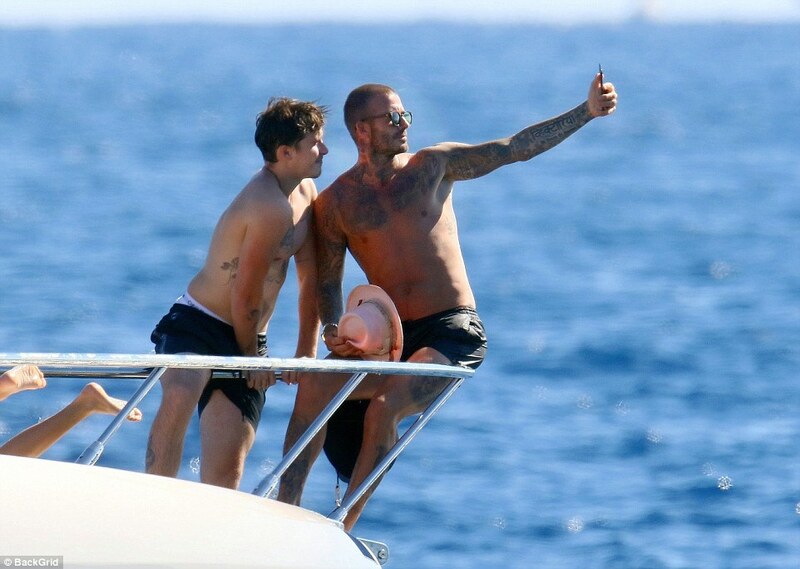 David and Brooklyn also snapped selfies with each other, looking out to sea. 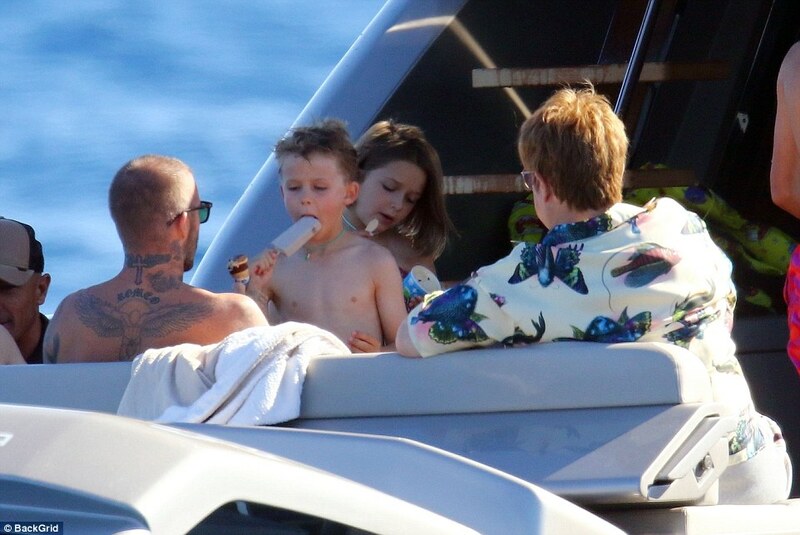 Brooklyn was seen applying sunscreen to his tattoo-laden torso, while Cruz enjoyed an ice cream. 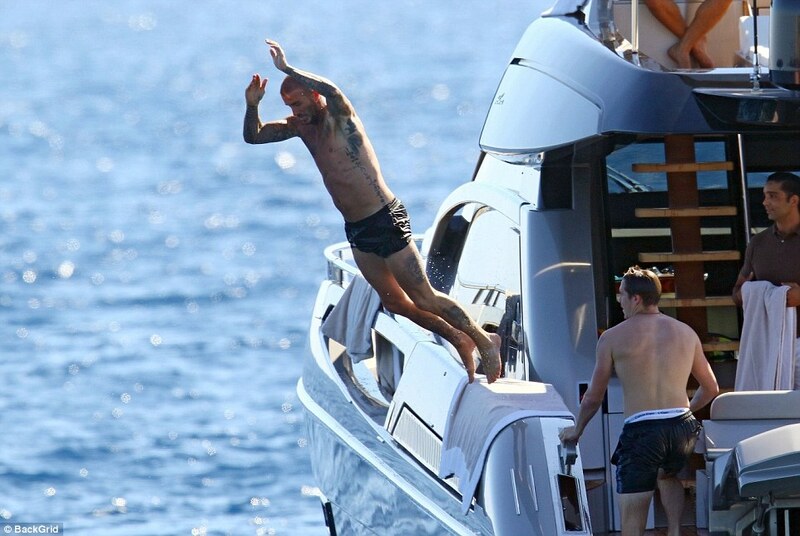 Romeo was seen perfecting his dives, known as the athlete of the children, a seasoned tennis player. The day before he celebrated his birthday and was presented with a tennis-themed cake. 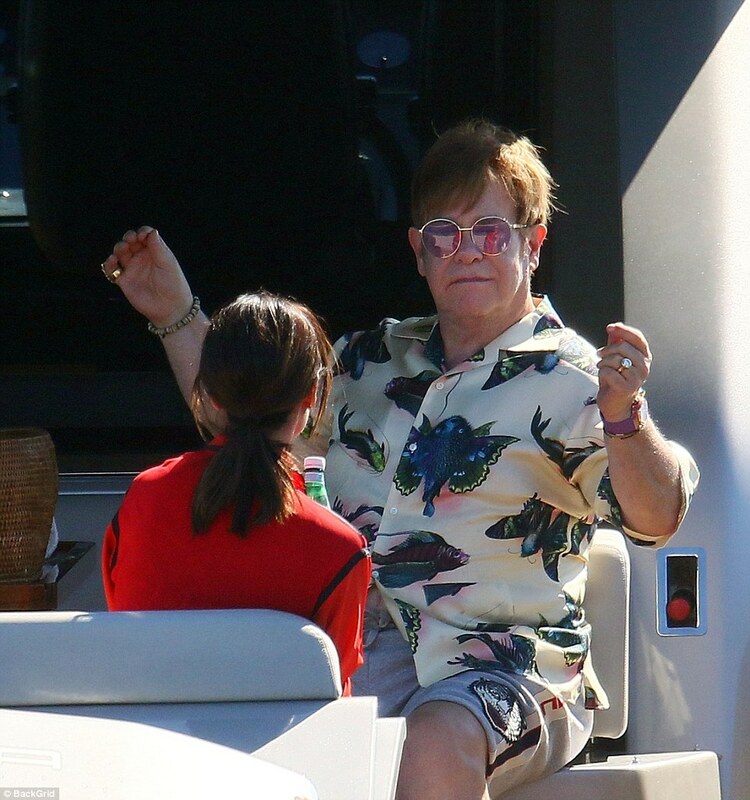 Meanwhile, earlier in the week, Elton was seen welcoming the Beckhams aboard the boat after dining together on the island Île Sainte-Marguerite. 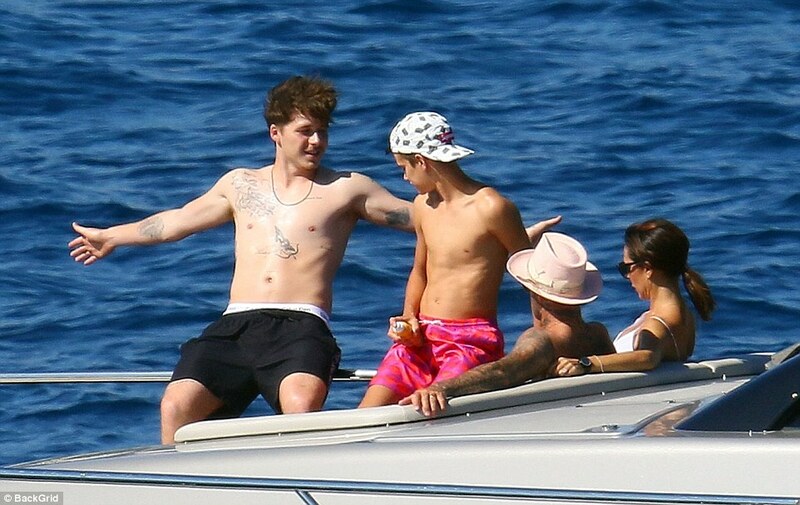 They were spotted leaving La Guérite restaurant half a mile off the coast of Cannes – on an end-of-summer trip before the new school year starts up again. 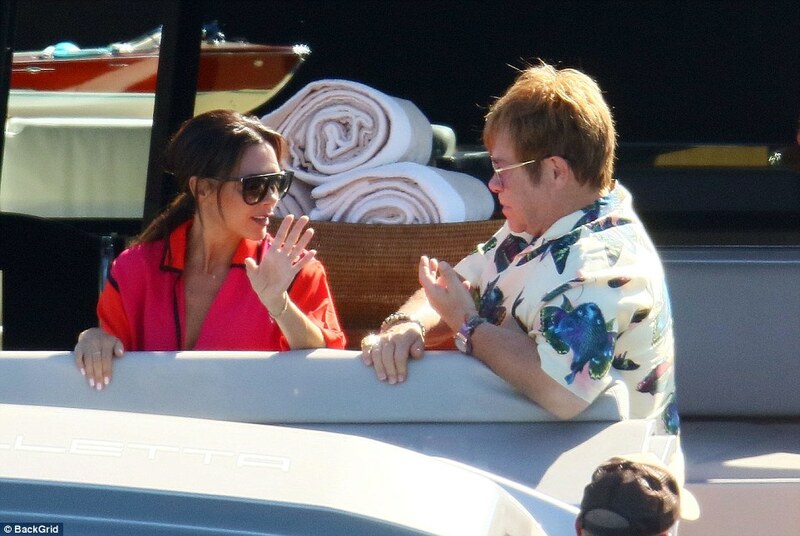 The Beckhams met Elton later on, ready to set sail – with Victoria – known for her ordinarily poised composure – looking excited as she gave a thumbs up to the Your Song crooner on arrival at the dock. 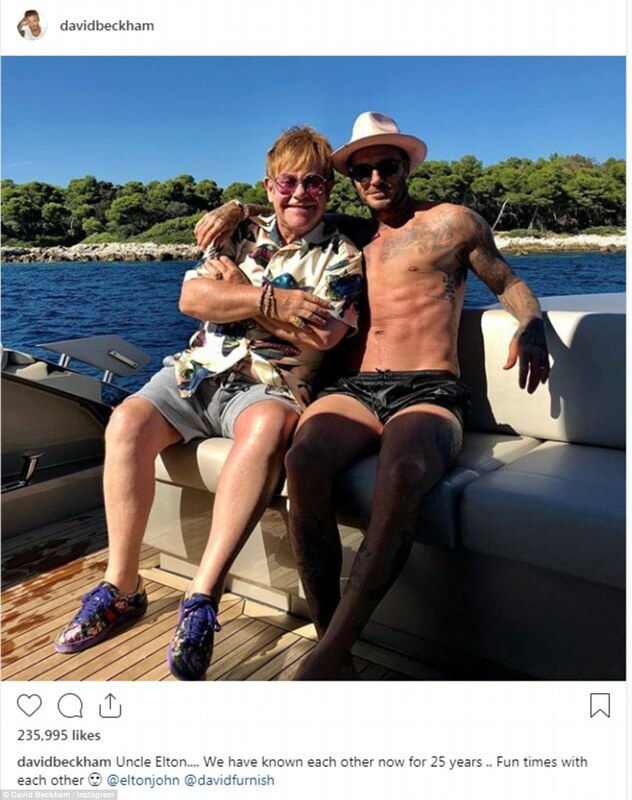 David was due to appear at Lavender Hill Magistrates Court in London on Tuesday over claims he drove his £200,000 Bentley at 59mph in 40mph west London zone, but did not attend in person, being abroad at the time.